With the chance to earn a significant amount of money through cryptocurrency, you might be looking into simple ways to amass cryptocurrency for yourself. While cryptocurrencies are often volatile, they can provide much greater rewards than traditional investment ventures. For example, in December of 2017, Bitcoin reached a record high of just under $20,000 per coin. When Bitcoin first released in 2010, it cost roughly $0.0008 to purchase a single Bitcoin. It’s much more difficult to get high-value cryptocurrencies these days, but it’s certainly not impossible. In fact, there are quite a few ways to get cryptocurrencies completely free. Rather than purchasing cryptocurrencies, these methods allow you to earn crypto for free, whether you currently have cryptocurrency or not. 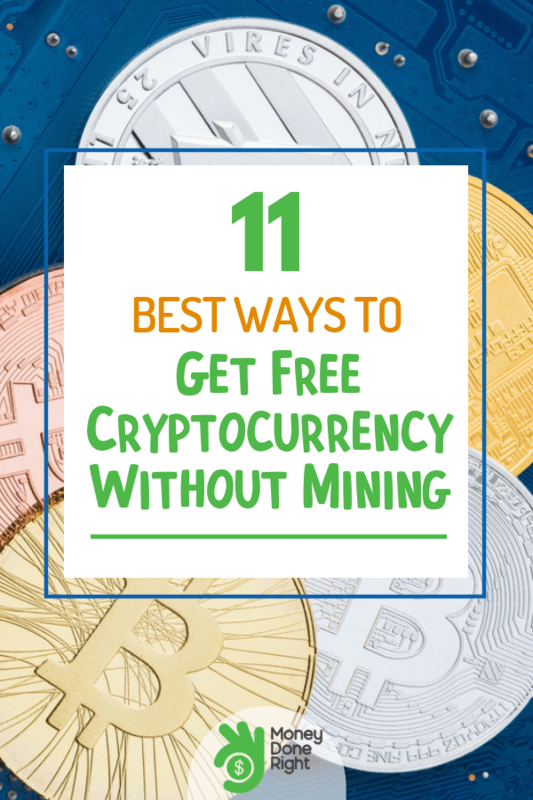 Here is Money Done Right’s guide to the 11 best ways to get free cryptocurrency without mining. Click here to see even more ways to earn money online! While cryptocurrency may sound complex, and in many facets it is, the idea of cryptocurrency is actually rather simple. Rather than a centralized form of physical currency, cryptocurrency is a digital peer-to-peer currency that is tracked through a public digital ledger. This public ledger is called a blockchain, and one of the most common ways to earn cryptocurrency is to mine the blockchain, which we will detail later in the article. This mass running ledger is encrypted to secure user data and to secure the entire system. Cryptocurrency can be used just like any other form of currency, it is simply housed digitally rather than being physically printed and minted. You also have the opportunity to invest in cryptocurrency through cryptocurrency exchanges, which is similar to the stock exchange. Rather than storing, receiving, and transferring money through a traditional bank, digital wallets are used to make these digital transactions. These wallets secure cryptocurrencies, make online transactions streamlined, and even give you access to the public ledger. Check out my experience buying Bitcoin to see if it’s right for you. Every cryptocurrency transaction made is added to the ledger queue. Before it makes it onto the public ledger, each transaction needs to be validated. Miners use software to validate the transactions in sets, which are called blocks. When a block of transactions is completed, miners work to validate the data as quickly as possible. The first miner to verify the data receives a cryptocurrency reward. The verified block is then added to the public ledger, creating a chain of blocks that make up the ledger, which is where the term “blockchain” comes from. As we mentioned, the entire system is encrypted, and the transactions are validated when the encryption is solved by mining software. Using a keyword, a string of numbers that only a specific keyword can produce (called a HASH), and a randomly generated number, advanced mining software works to validate all transactional data before any other user. Before the rise of the cryptocurrency market, it was possible to mine from your home computer and earn a lot of cryptocurrencies. As prices skyrocketed, more and more miners began competing for crypto, and more and more transactions began occurring all over the world. Now, it would take years for a home computer to validate just one block of transactions. This has caused many miners to rely on expensive mining software through cloud-based applications. Click here for some other ways to use cryptocurrencies! If this all sounds too complex, we’re here to show you a few simple ways to get free cryptocurrency. You don’t need to invest in expensive mining software and you don’t need to be a cryptocurrency expert to make money through cryptocurrency. Here are our top 11 ways to get free cryptocurrency without investing in mining. While there is often an initial up-front cost for buying into an Initial Coin Offering (ICO), many ICOs offer lucrative coin bonuses. ICOs are a new way of raising capital to fund a new business venture, and the value of the new coin ties to the overall value of the company. Many ICOs will allow you to buy in with your existing cryptocurrencies. You simply exchange some of your existing coins for the new coin at a set exchange rate. An ICO works much like an Initial Public Offering (IPO), but rather than owning stock, you’ll own new digital currency. One of the draws of purchasing into an ICO is the opportunity for bonus coins. For example, you exchange 10 tokens, or coins, of X currency in exchange for 5 coins of the new currency. In an ICO, you might receive an additional 5 coins on top of the 5 you already received as part of the initial offering to draw investors, which makes it a great way to earn free cryptocurrency. We always advise that you thoroughly research any ICOs before buying in. The cryptocurrency market has been rife with ICO scams, and if a bonus offer sounds too good to be true, it often is. There is always financial risk when entering an ICO. However, if the currency is stable and produces consistent growth, purchasing at the initial price offering can result in serious financial gains. Click here for some other great ways to build wealth! As we mentioned earlier, the role of a wallet software is to house and transfer coins from peer-to-peer. All you need to do to use a wallet is simply download the wallet software, such as Coinbase or Uphold. There are countless wallets available for use. Many of them have free coin offers from time to time for downloading the software, signing up for a new account, or creating a new wallet in your existing account. These offers typically happen in alignment with an ICO, so be on the lookout for free coin offers as they typically last for a short period of time. With so many wallet options out there, always be careful when downloading new software to your computer or mobile device. Some wallets offer lucrative promotions to get you to download the software, which in turn downloads malware to your device. We recommend using trusted, secure wallets such as Copay Cryptocurrency Wallet, Bitcoin Core, Coinbase, and Edge Wallet. These wallets are some of the most popular on the market for their ease of use and high-end security, making them a safe and reliable wallet choice. In addition to free crypto offers for signing up, creating a new wallet, or taking advantage of a special promotion, some wallets also offer airdrops. Airdrops are a method of earning free crypto that doesn’t require you to do anything other than have a specific wallet. Airdrops are a way for the teams behind the wallets to gain more users. These highly effective strategies give new and existing users free crypto through various engagement touch points such as social media, email, or through the digital wallet itself. The goal of an airdrop is to raise brand awareness and gain new users, and if you’re an existing wallet holder, you’ll be able to grab free crypto through airdrop marketing strategies. If you hold a wallet that has an airdrop, you will typically need to request the airdrop through the various means of communication that the wallet offers, whether that’s email, instant messaging, or social media. This approach makes airdrops an incredibly simple way to earn free crypto without mining. Taking surveys is a popular method to earn cash and gift cards online, but now you can also take surveys to earn free cryptocurrency. There are multiple sites and apps you can download that will pay you in cryptocurrency for taking surveys. Again, there are plenty of sites and apps that are simply scams, but there are also plenty of legitimate sites and apps that will pay you real cryptocurrency for completing surveys. Kinit is one of the most popular cryptocurrency survey sites in the world, and operates just like survey sites that pay you in cash and gift cards. Complete surveys and daily activities to earn Kin, a new cryptocurrency you can use on the app to redeem gift cards and other fun prizes. Kinit plans to partner with brands around the world and reward those companies with Kin for creating engaging and exciting experiences, rather than generating revenue from ads and selling user information. Earn.com has another popular app that rewards users with cryptocurrency by taking surveys, completing activities, and engaging with the app. It also is a Bitcoin affiliate program, meaning you can sign up as an affiliate and earn Bitcoin every time someone uses your referral link to sign up. Rather than spending your time taking surveys and earning a few cents to a few dollars per activity, you can earn cryptocurrency that can grow in value over time. This is a great and very easy way to earn digital currency for free. Click here for even more survey sites and other opportunities to make extra cash or earn cryptocurrencies online! Faucets are another marketing strategy to get users to go to a specific site and engage with the site or advertisements on the site. While the earnings are relatively small, a faucet may be a simple way to get free cryptocurrency without having any upfront investments. When you locate a faucet, which is typically a webpage that is full of advertisements and other engagement links, you can complete actions such as clicking on the links or filling out informational surveys. Completing these tasks may grant you a small amount of cryptocurrency, but it’s never a guarantee. Check out other passive income opportunities here. Cryptocurrency programs are available to those who are part of crypto exchange sites, and if you currently hold crypto, you’re more than likely already a part of one of those exchange sites. These exchanges often have a referral program, much like an affiliate program. When you get others to sign up using your referral link, you can earn free crypto or other rewards. Users have to complete specific actions, typically a minimum number of transactions or buying and selling a minimum amount on the exchange, in order for you to earn your referral reward. Using an exchange’s referral program is one of the easiest ways for you to earn cryptocurrency for free, with very little involvement needed on your end. Remember, always go through secure, safe exchanges to avoid common scams. Cryptocurrency is one of the most volatile investments available today, but it can also be one of the biggest payoffs if you invest correctly. Rather than viewing cryptocurrency as merely a currency, you should think about crypto as an investment. Just like the stock market, cryptocurrencies fluctuate day to day based on how many people use it and its market value. Exchange your coins strategically and you’ll see real gains in the form of free crypto. The exchange rate plus the interest earned from the increase in market value isn’t the easiest way to earn cryptocurrency for free, but it can be the most lucrative. Read about our experience buying Bitcoin. There are many companies around the world that partner with cryptocurrencies to run exciting and fun promotions for doing the shopping you already do online. When you shop at a specific partnering retailer, you may get a certain percentage of your sale back in the form of cryptocurrency. There are also wallets that have browser extensions designed to recognize online stores that have cryptocurrency offers, making it easier than ever to get free digital currency. Get your finances on track and earn crypto for free by meeting your saving goals through Long Game Savings. Long Game Savings was created to help consumers make smart saving decisions through incentives, including cryptocurrency. The site lets you unlock fun online games that give you cryptocurrency for free. These games are unlocked by setting personalized savings goals and meeting those goals. Long Game Savings monitors your saving when you link your bank account and gives you the tools you need to meet your financial goals. The platform also provides you with free digital currency for playing games. The site partners with Ethereum, Brave Browser, and 0x Project to provide free virtual currency by staying active on Long Game Savings, meeting savings goals, playing games, and completing other activities. In addition to providing free cryptocurrency, Long Game Savings also offers free resources to teach you about cryptocurrency and how to navigate the market successfully. After you earn, simply link your wallet and withdraw your crypto to use it how you want. Click here to earn free cryptocurrency by signing up for Long Game Savings today. Bituro is one of the most popular ways to earn digital currency and is a leading market research provider. Like survey sites for cash and gift cards, Bituro allows users to take surveys on the products and services they use every day. Rather than getting only points, cash, or gift cards, users receive cryptocurrency rewards, and have the option to earn cash and gift cards as well. Some of the activities you can do to earn cryptocurrency include completing surveys, installing applications on your phone, and watch videos. There are new offers almost daily, giving users plenty of opportunities to earn points and redeem them for various cryptocurrencies. Maximize your earnings through the Bituro referral program, earning you 10% of the points that all of your referrals earn. Link your wallet to easily withdraw your crypto, and be sure to download the Bituro app to earn even more on the go. Sign up for Bituro to start earning free cryptocurrency today. Our final way to earn free cryptocurrency without mining is through Coin Bucks. This site allows you to earn free Bitcoin by completing various online activities, much like Bituro and other similar sites that we’ve covered. Coin Bucks has a robust selection of fun and exciting offers that you can redeem through the app or directly on the site. Browse the thousands of offers and select the ones that you want to redeem. Complete the offer requirements and watch your account grow with instant credit after completing the offer. Coin Bucks also offers daily payouts, meaning you’ll get your Bitcoins in your wallet the day after you earn them, automatically. Offers include providing information via surveys and forms, installing apps, and promoting and sharing Coin Bucks via social media. The site also offers a lucrative referral program and the opportunity to earn bonuses by ranking up the Coin Bucks tiers by completing these tasks. Get started with Coin Bucks to earn free cryptocurrency today. At Money Done Right, we want you to succeed in all of your financial endeavors, and we’ve seen cryptocurrency make a positive impact in financial markets. You don’t need to invest in pricey mining software in order to break into the cryptocurrency market. And with so many free ways to earn cryptocurrency, now is a great time to jump in. Do you have any experience trading and exchanging cryptocurrency, or do you have any other ways to earn free cryptocurrency without mining? Let us know in the comments below! Want even more ways to grow your wealth? Check out these ideas.